South Africa: Does Marikana Really Have 60,000 People? Marikana informal settlement in Philippi East. On Wednesday, the Western Cape High Court ordered the City of Cape Town to purchase the land on which the Marikana informal settlement is located. In GroundUp reports of this case we usually wrote that 60,000 people live in Marikana. That number is from the court papers. But a sceptical reader has questioned it, so we tried to do our own estimate. Marikana is the name given to the land in Philippi East by the thousands of people who have moved onto it since 2012. The land is split between at least three private owners, but only one of them, Iris Fischer, lives on it. If the court order isn't challenged, the state will have to buy her home at a price that assumes there is no informal settlement (the existence of the settlement reduces the value of her home, so this is an important nuance). The 60,000 figure is given in the residents' court papers and they in turn got it from the City as well as estimates by the owners of the land. In court, this was the number that was bandied about. To estimate the number of people living in Marikana, we would like to count the number of shacks in the photo and multiply by the average number of people living in a shack. But counting shacks is more easily said than done; we simply don't have the time to do it. And we can only guess the average number of people per shack. So to estimate the number of shacks we counted the number in a small section, and then using the Google Maps measurement tool and basic arithmetic we worked out the total number of shacks. But there's a problem with this methodology if you look at the map carefully. The density of the shacks changes dramatically. It's hard to know if our selected area is representative. Therefore we selected a low-density area and a high-density area, and estimated lower and upper bounds for the number of shacks. Using this methodology we found that there are between 7,700 and 11,000 shacks in the settlement. What is the average number of people per shack? There are various estimates for this for informal settlements. Based on the average household size at low income levels given in a Bizcommunity article, a lower bound for the average is a bit more than three and a higher bound is just under five. But the number of people per shack in Marikana is likely lower than other informal settlements, because many younger people moved there from cramped backyard shacks so that they could get more space. We therefore used three as the lower bound on the average and four as the upper bound. Using these figures we estimate that the number of people living in Marikana is between 23,000 and 44,000. This is a wide estimate, but considerably lower than 60,000. 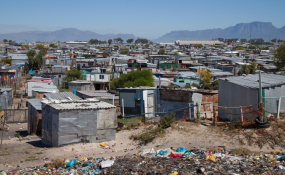 The Housing Development Agency estimated that 144,000 people lived in informal settlements in Cape Town in 2011. This is an organisation with the professional expertise and mandate to make such estimates, but as their report makes clear making these calculations is difficult, even when based on census data, as their report is. We're not experts and we did our analysis in a couple of hours, so treat our estimates with caution.